I’ve been a fan of Chris Hodgson since he started the food truck Dim and Den Sum, so I was very much looking forward to trying out his brick-and-mortar restaurant downtown, which took over the space formerly occupied by Zinc Bistro. The space is very inviting (especially the patio), but we were seated in the back room to avoid the heat of the day. We were there in early July, so the menu had some spring and summer features on it (yes, I realize I am behind on my posting…). Our waiter was impressively knowledgeable about every ingredient in every dish. I had several vegetarians with me, and he was able to bring out a veggie-friendly serving of tater tots and warn them if they were ordering a supposedly vegetarian entree that used beef stock (for example). I was really impressed! We started out our meal with several servings of those delectable tater tots (I used to seek out the food truck just to get some of those tots!) 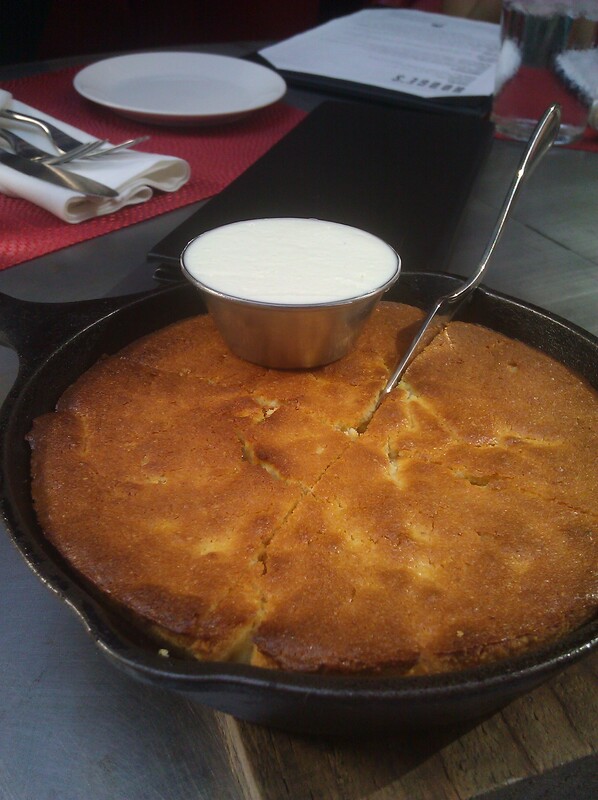 followed by a piping hot skillet of corn bread. 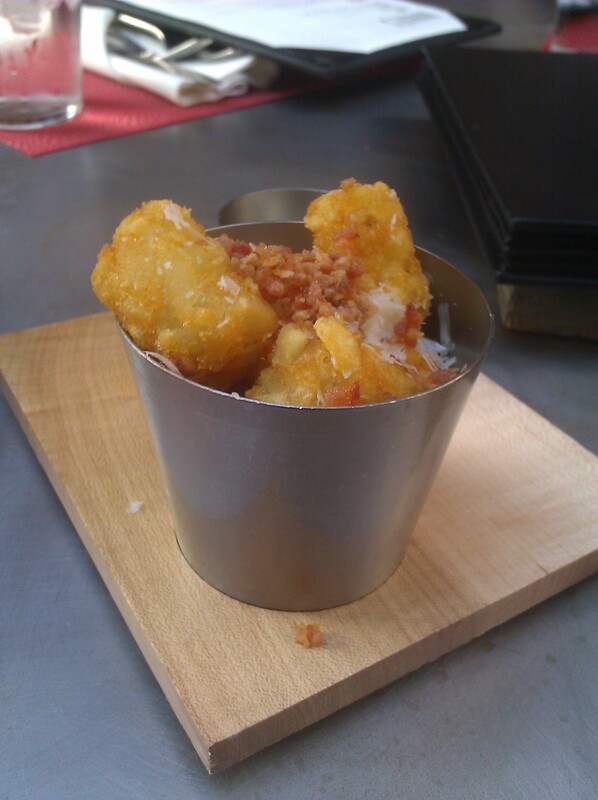 As expected, the tater tots were crisp on the outside and creamy and moist on the inside. The addition of bacon and cheese was a really nice addition, and I may or may not have taken advantage of the fact that I was the only non-vegetarian on my side of the table and eaten the whole thing by myself. The corn bread was moist and delicious as well, with just a hint of kick to it. I love a good corn bread and slathered my slice with lots of butter. I just had my appendix out a little over a week ago, and I think I was having a pre-appendicitis bout that day because my appetite had disappeared at that point. I decided to go for something small and light. I ordered the pea soup as a starter and the lobster corn dogs for my main. The pea soup was amazing. I love a good pea soup, and this one did not disappoint. 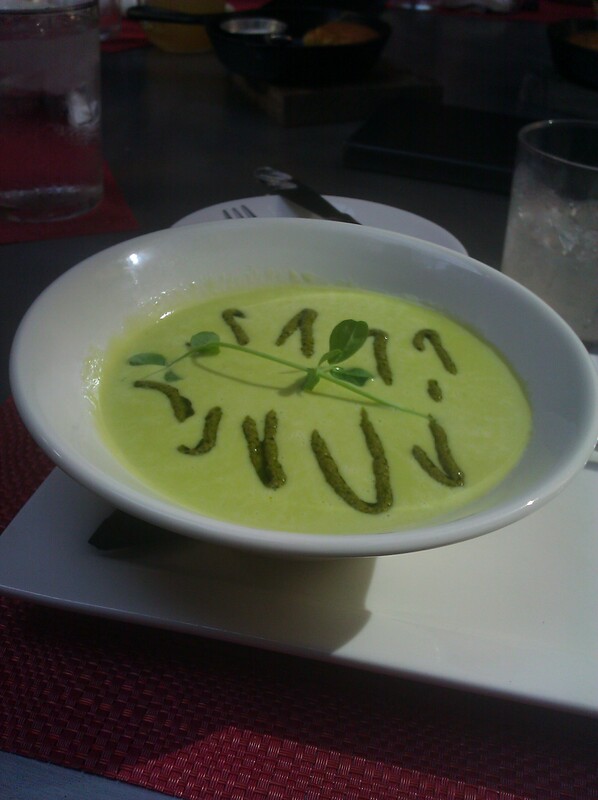 The pea tendril and garnish added to the freshness of the soup. I wish I had twice as much of the soup, because I could have eaten it forever. It was absolutely delicious! I wasn’t as thrilled with my lobster corn dogs, which came served with chipotle aioli, “tarter” sauce, smoked apple and red pepper jam to dip. I don’t know what I expected, but it wasn’t what I expected. They were good, but didn’t wow me. 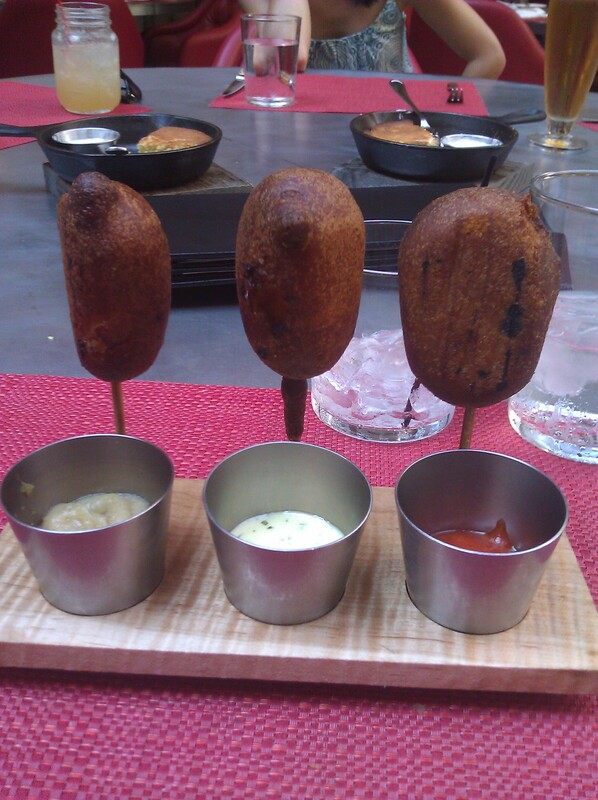 The corn dogs were lacking in spice, and I think most of the flavor came from the dipping sauces. I ended up taking them home. I’m going to blame my lack of appetite though. At that point I wasn’t feeling well, so it probably wasn’t the food. The next time I go I will definitely order the gnudi or the fried chicken. I had bites of each, and they were absolutely delicious. My friends also raved about the French Onion Ravioli (ricotta and gruyere ravioli, french onion reduction, parsley, and gruyere croutons) and the 6 Veg (potato shards, cumin roasted carrots, stewed greens, roasted cauliflower, snow peas, and brussel sprouts). Everyone I was with raved about their food. My friend M. was the only one to order dessert, which was delicious. She chose the coffee ice cream and Chef’s “chow” and ate every last bite. It was really good – in fact all of the desserts sounded wonderful and unique, so try to save room for dessert when you come here. 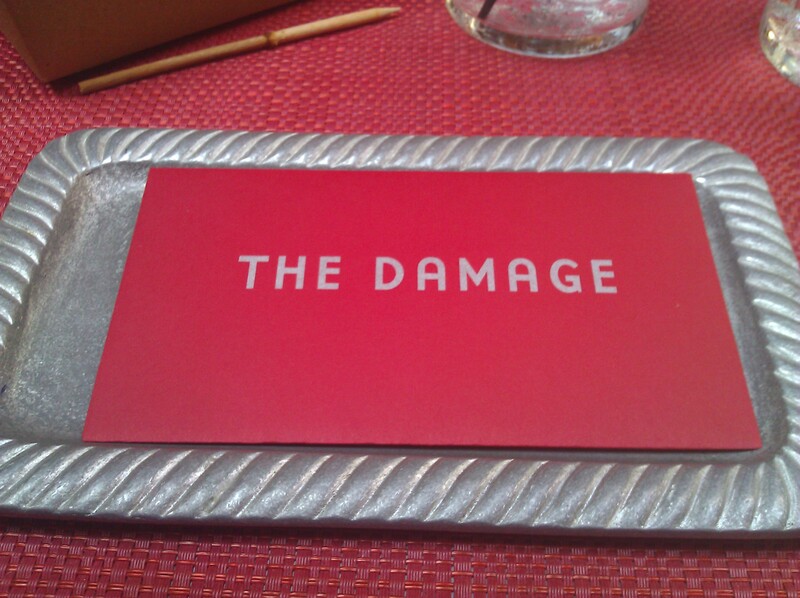 I was actually looking forward to getting the bill, which is served on a silver platter in an envelope labeled “The Damage.” Just another way Chef Hodgson’s humor shines through. Hodge’s offers several interesting specials, including beer and a burger Mondays for $10 and a 2 for $40 special on Tuesday featuring an appetizer, 2 entree and a bottle of wine for $40. So if you haven’t checked it out, what are you waiting for? And if you’ve already been there, isn’t it time for another visit? Hodge’s is open for lunch and dinner Monday through Friday and serves dinner on Saturday and Sunday.